The shoulder is a joint that sustains the biggest range of motions in the body. Due to the fact that it’s built to perform a wide variety of movements on a daily basis, and because it’s used so often, the shoulder is prone to instability. In fact, no matter what age you are, and how much physical activity you perform, you are prone to a shoulder dislocation. This type of injury does not only happen during sports and due to overuse, but during everyday activities or falls as well. Unfortunately, once a shoulder has been dislocated once, it becomes vulnerable to further similar injuries. The repetitive episodes of dislocation injuries lead to shoulder instability and chronic shoulder dislocation. At the time Andy Vo visited Dr. Armin Tehrany at Manhattan Orthopedic Care, he was a 27-year-old who had suffered from immense shoulder pain and chronic shoulder instability caused by 20 shoulder dislocations. 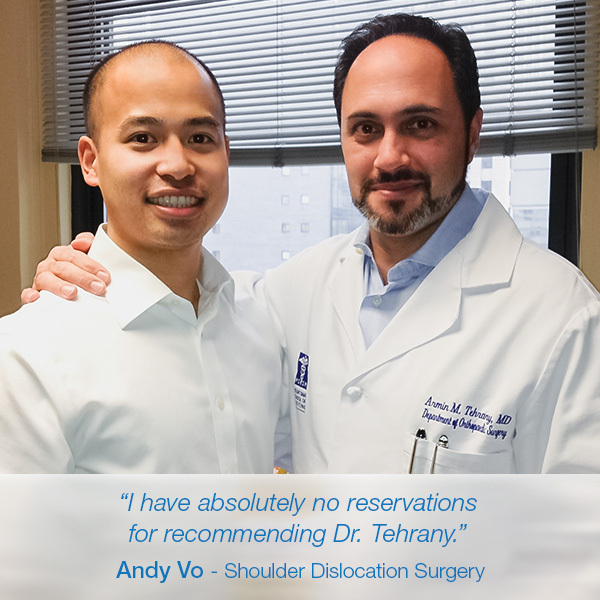 After thorough research, Andy decided to meet with Dr. Tehrany and discuss his shoulder treatment options. “I am a very avid sports enthusiast, and it is central to my passion/hobbies. I had chronic issues with my shoulder dislocating and after careful research went to meet with Dr. Tehrany in 2010. After a careful consideration and analysis of Andy’s chronic shoulder dislocation situation, Dr. Tehrany decided to perform an arthroscopic shoulder surgery known as the Remplissage shoulder surgery in order to repair Andy’s severe condition. “The operation was smooth, as was post-op care (equally as important as the operation). I must note that I had a more uncommon additional procedure to tighten up my shoulder to prevent further dislocations. Other than that, it was arthroscopic surgery to repair a labrum tear and clean up bone spurs. My rotator cuff was intact. Today, 5 years later, I can say that my shoulder is the strongest it’s ever been. Through careful diagnosis, surgery, and post-operative care, Dr. Tehrany and team were able to wildly exceed my expectations of how I use my shoulder. Previously, range of motion was limited, strength was capped, and the constant fear of dislocation inhibited my enjoyment of activities and life,” enthusiastically explains Andy. As caring medical professionals, Dr. Tehrany and the MOC team took the time to not only understand Andy’s medical history, provide the ideal treatment solution for his condition, and guide him through the process of a top-notch post-op care, but to assist him with the out-of-network insurance process as well. “I have absolutely no reservations for recommending Dr. Tehrany. In addition, his team was amazing in helping me navigate the process with my insurance to optimize my coverage. Andy’s full recovery and words of praise for his experience with us are the most rewarding parts of our orthopedic profession. Thanks Andy for choosing Manhattan Orthopedic Care for your Remplissage shoulder surgery.